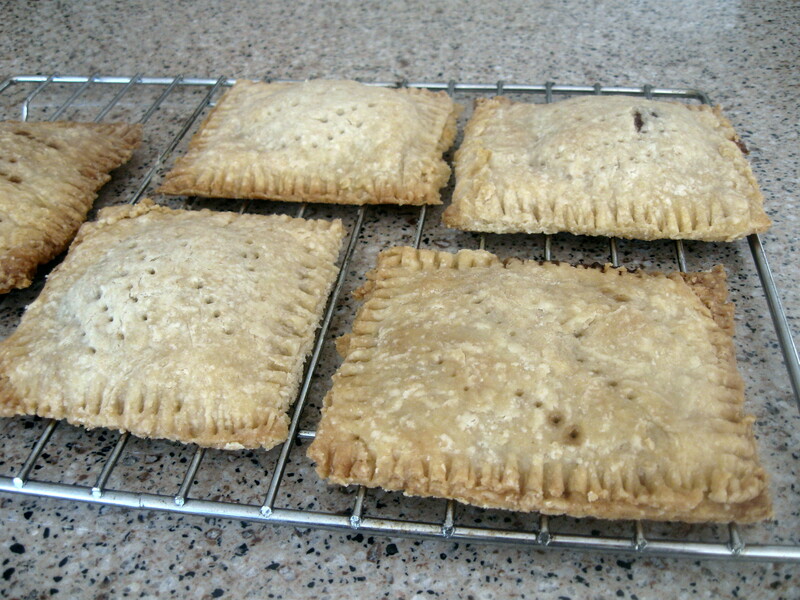 I had bookmarked this homemade pop tart recipe from Smitten Kitchen two years ago, but never got around to making it. If I am going to bake something sweet for breakfast, I would rather make something like a muffin or scone. Plus, I am not that great with a rolling pin. But then my mom saw the recipe, and she is good with a rolling pin, and we had all the ingredients on hand. It was fate. We followed the recipe from Smitten Kitchen very closely, but substituted 1 cup of whole wheat pastry flour for the all purpose flour. (Sorry to report, that does not make these a ‘healthy’ breakfast!) We made half of them with a cinnamon and sugar filling and half of them with a jam filling made from both blueberry and strawberry preserves. Since it was a hot and humid summer morning, we had to put the dough in the freezer fairly frequently. Every time it got too soft to work with, we tossed the dough, dough mat, and all right into the freezer for about 15 minutes, and then started again. In other words, the next time we try this recipe will be in January! The pastries came out of the oven lightly brown, with a tender and flaky crust. Is it possible for a pastry crust to be too flaky? Because these came close. I may look for other variations of the recipe which would be a little sturdier. Both the cinnamon and jam fillings were delicious, but someone suggested a Nutella filling which I think we have to try. And my sister suggested we work on an icing. While we’re not anywhere near to putting Kellogg’s out of business, this was a really fun project with a delicious end result. As promised, here is one way which I enjoyed my Cilantro Lime Rice and Beans. I was inspired by Closet Cooking’s Asparagus Huevos Rancheros, but I ditched the corn tortilla. 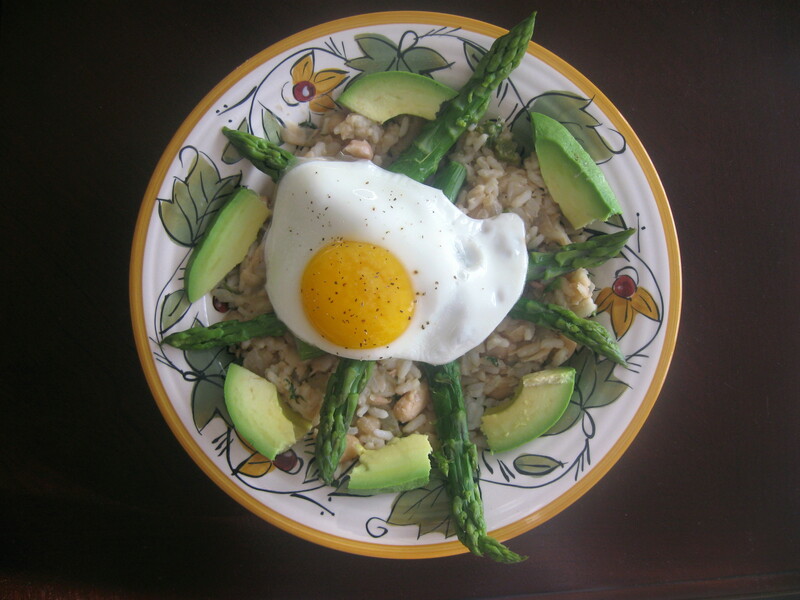 The layers include the rice and beans, freshly steamed asparagus, a fried egg, and sliced avocado. You could add some salsa verde, or queso fresco, but I was very happy with this combination. The other ingredients balanced the spice level of the rice, and this was both delicious and filling. It could be breakfast, lunch, or dinner! My family’s Christmas morning breakfast tradition includes 3 things: Spinach Quiche, Whiskey Cake, and lots of coffee. We’ve been working to modify some family recipes to accommodate the egg allergy which presented this year. Sometimes we use ground flax (pancakes), sometimes we use chia seeds (meatballs), sometimes we leave the eggs out entirely (lasagna) and sometimes we use Ener-G egg replacer. This past weekend, I experimented with an eggless quiche. The original recipe is from the Ener-G site, although I made a few changes. I didn’t want to bother with a crust, and I changed the vegetables since I don’t really like peppers. Although this recipe still has a lot of saturated fat, I tried to cut back in a few places by using light cream and reduced fat cheese. The consensus was that the dish was edible, but it wasn’t quiche. The texture was off, and it lacked flavor. However, I was impressed with the volume created by mixing the egg replacer with cream and milk. The recipe needs some major changes, but the product works. Now the big question, is there time for another breakfast experiment before Santa arrives? Stay tuned for Take Two! Place onion, tomatoes, and mushrooms in the bottom of a 10″ pie plate coated with cooking spray. Reserve 1/2 c. cheese, and spread the remaining cheese over the vegetables. In a large bowl, beat egg replacer, cream, and milk with a hand mixer until foamy. Scrape sides of bowl as needed. Pour mixture into pie plate. Top with remaining cheese. Bake at 375F for 35-40 minutes. Allow to set for 15-20 minutes before cutting. I’ve been wanting to try this Breakfast Enchilada recipe for a while. Your favorite fillings go inside the tortillas, which are then set in a mixture of eggs and cheese. I really like breakfast casseroles, especially ones like this which you can make the night before, and then bake in the morning. The original recipe included chopped peppers and ham, neither of which are on my list of favorite foods. So I used onion, mushrooms, and spinach, and kept the dish vegetarian. I also reduced the overall amount of cheese and traded in the half-and-half for skim milk to lighten things up a bit. The end result was quite good, but I was thinking that it would be even better with some fresh tomatoes and sour cream on top. Since I didn’t have any of that in the house, I paired an enchilada with some fresh fruit for a complete breakfast. Keep this recipe in mind, especially if you’re having company for breakfast or brunch over the holidays. Heat oil in a large frying pan. Saute onions for 15-20 minutes, until soft and beginning to brown. Add mushrooms, and cook until mushrooms are soft. Stir in spinach and heat through. Remove from heat and allow to cool briefly. Place 1/2 c. filling in each tortilla, roll, and place seam side down in a 13″x9″ baking dish coated with cooking spray. Meanwhile, whisk together eggs, milk, and flour, and season generously with salt and pepper. Pour mixture over tortillas. Sprinkle cheese evenly over the dish. Refrigerate overnight if desired. Bake at 350F for 35-40 minutes covered with foil. Remove foil, and bake an additional 10-15 minutes. Remove from oven and allow to set for 5 minutes before serving.